In the minds of both consumers and OEMs, energy efficiency is not necessarily immediately associated with both high product quality and affordability. Disruptive innovations that deliver improved efficiency in products and technologies are usually initially met with concentrated resistance from entrenched interests. But in fact, efficiency is both a main driver for and a result of good design and engineering, and efforts to improve efficiency, whether intentional or otherwise, usually result in higher product quality. Efficiency can lower the total cost of higher quality goods and services for both users and producers and can facilitate the market adoption and scalability of new innovations. And as customers across many national and global market sectors become increasingly aware of and concerned about environmental impacts, they are demanding more efficient products and services at affordable prices. But efficiency and affordability, even together, are not enough to differentiate new products if they don’t meet crucial user needs for quality, convenience, and many other attributes. Those of us involved in marketing efficient technologies or strategies are frequently frustrated by misperceptions about the real cost, and ROI, of innovative, efficient products or services. Resistance to change is everywhere- entrenched interests threatened by disruptive technologies will appeal to the public’s risk aversion and resort to pervasive campaigns of misinformation around new products or initiatives. These tactics are identical to those used by current political campaigns, because there are always strong entrenched political interests in the production and control of energy and resources. To cite only a few examples: false assertions that opposing more fossil fuel projects like the Keystone Pipeline means opposing jobs for Americans; that tighter emission controls will ruin the economy, the auto industry in particular or American industry in general (or all three); and that green buildings or green products are too expensive. In most cases history has shown a different story – regulatory initiatives, relentless innovation, market forces, or a combination of all three force industry to consider new measures, which they staunchly resist as long as they can. When they finally relent and significantly reinvent products or processes, the economic outcome is usually positive- products improve in more ways than just becoming energy efficient, companies that successfully adapt make money, and consumers get not only better environmental protection but higher quality products that are not only ultimately more affordable up front, but carry a lower operating cost and total cost of ownership. One of the most dramatic illustrations of increased efficiency coupled with improved quality in relatively recent history is the case of household refrigerators in the late 1970s. Faced with an energy crisis and booming energy use rates, regulatory agencies in California and eventually the federal government instituted a series of programs by which industry groups and manufacturers collaborated and succeeded in significantly reducing energy use of refrigerators while simultaneously making them bigger and better. As a result, the new and greatly improved class of refrigerator – the largest single energy consuming appliance in U.S. households- contributed to a significant reduction in per capita energy use, and refrigerator manufacturers enjoyed robust growth and profits. Toyota’s Prius is another example of a high quality, energy efficient, affordable product. Of the limited crop of electric vehicles introduced in the 1990’s, the Prius is pretty much the only survivor, as car companies largely killed their EV programs when they realized they could put off complying with emission standards seemingly indefinitely. The Prius led the way for mass market adoption of more energy efficient vehicles and proved that the public cares about energy efficiency in cars. Two main problems with cars are: 1) there are already too many of them, so even making them hyper efficient doesn’t address problems caused by decades of auto-centric urban development patterns and the attendant expensive infrastructure, and 2) energy efficiency problems with cars largely derive from the fact that they’re too heavy- replacing steel with carbon fiber and other lighter materials, as the Rocky Mountain Institute (RMI) spinoff Hypercar project is doing, is a crucial step in this direction. RMI’s work has shown that it’s entirely feasible to make super energy efficient vehicles at scale that are affordable, safe, and appealing to buyers. Green buildings are increasingly becoming more affordable and practical, and in the process, overall building quality is largely improving. True green buildings are those that use significantly less energy than “standard practice”- 50% to 70% and even less. With ever-improving integrated design practices, deep green buildings on a standard budget are becoming more and more feasible. The recession has made it necessary to focus attention on the energy efficient retrofitting of existing buildings, which can be seen as a “greener” practice than new construction. Green buildings offer many more benefits to owners and users beyond energy efficiency: improved indoor environmental quality; increased comfort safety, and productivity for employees; higher rent and lease rates for owners; and lower operating costs. While energy efficiency is almost never a direct driver for improved performance in computing, I can’t think of a single product in recent history that gives more services per watt than the iPhone. To me, the 4.75” x 2.5” device is a singular miracle of elegance, engineering, excellent interface design, and utility. The design strategy here was to pack much more usefulness into a convenient package without increasing total energy use. Affordability of the iPhone is a matter of opinion, I suppose, but iPhones are certainly within reach of a wide mainstream market. Main competitor Android is succeeding mainly by imitating the iPhone's design, not by innovating: much as Microsoft imitated Apple's operating system. But it's obvious that energy efficiency alone is not sufficient to ensure product adoption-electric cars, solar panels and CFLs all have significant scaling problems, each for different reasons, but they all miss the boat in some key way. Electric cars don’t necessarily represent a net effect in energy efficiency, but more of a strategy of displacing pollution from the car itself to the emissions of the coal fired power plants that produce half of our electricity. EVs have long suffered from one big limiting factor from the standpoint of consumers- battery life. Even though most drivers’ use patterns could accommodate a 50 mile range for daily driving, we use our cars for such a wide range of driving that anything less than the standard range of gasoline powered cars is untenable. And of course they're still cars- cars that clog the massive network of roads required for our location-inefficient urban infrastructure. Solar panels are a more complicated issue, but the limiting factor in their adoption has been upfront capital cost, not so much cost of the PV modules themselves (which has been dropping swiftly as China ramps up production), but installation and related system costs, which are roughly two-thirds the total cost to end users. ROI is not always clear to purchasers, and government incentives have largely disappeared. Plus, the efficiency of the modules is improving rapidly, so buyers rightly fear that their installation will be obsolete soon after purchase. PVs are definitely an important part of an overall energy strategy focused on renewables and distributed generation, but they’re only one component, and not necessarily yet a key driver in retooling our energy infrastructure- possibly they will be when combined with smart grid technology. One of the best examples of a very energy efficient product with a fatal flaw is CFLs, which are affordable but widely hated for the quality of the light they produce (although to be fair they have improved since first being introduced and are continuing to improve). Lighting has been until very recently an overlooked product category for improved quality, affordability and efficiency. LEDs which finally solve quality of light problems and offer much more affordable products are just beginning to enter the market. The history of technical developments and market adoption in man made lighting has a fascinating trajectory to it, with people preferring the specific light quality of previous sources like gas lamps and incandescent long after replacement technologies become entrenched. For instance, there’s now a market for vintage carbon filament bulbs, which feature weak and flickering light output that create a certain "mood." I will post a lot more on lighting in the near future. 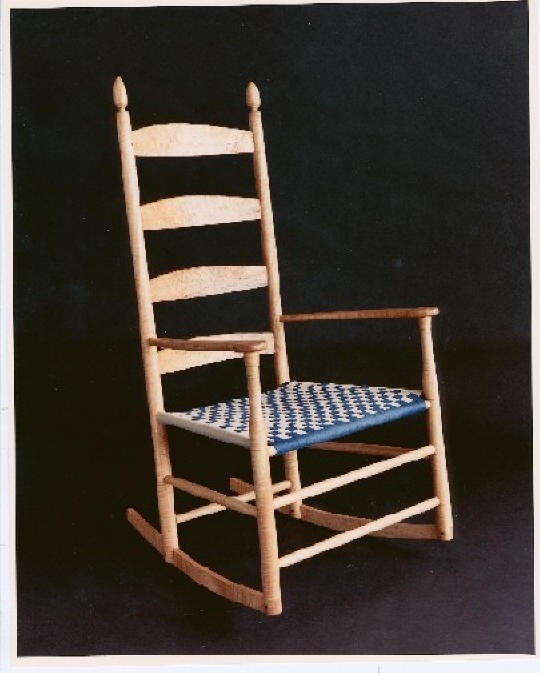 An image of efficiency that comes to mind for me often is the Shaker chair-I have fond memories of assembling one of these from a kit and using it to rock my baby daughter to sleep about a quarter century ago. I’ve always had a great respect for anyone who can design a chair, especially for mass production: they’re a lot harder than they look. Elegance and efficiency in design comes perhaps not so much from what’s there, but from what’s not- there’s just enough material to provide strength and support, and not an ounce more. That this design style evolved from a community of craftsmen who viewed the creation of artifacts as an act of devotion and worship only lends to its appeal. 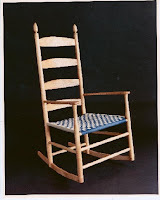 Of course Shaker furniture has been in high demand far beyond the reaches of Shaker communities for many generations, testament to our innate appreciation of efficiency, utility, affordability and quality.